Who Invented the 80 column, Rectangular Hole Punched Card? Can any of you shed any light on the contention made at http://www.bbc.co.uk/ahistoryoftheworld/objects/An83QjDmRISUKsIRVwTMDA that British Tabulating Machine company actually invented the rectangular hole, 80column card, and it was later adopted by IBM? I am a little confused about who created the 80 column format. Most everything on the internet gives IBM credit for having introduced it in 1928, however I used to own the machine below which was manufactured by the British Tabulating Machine Co. in 1919. I have several photos available for posting, but not sure of how to do this. the Empire. The American Company subsequently became IBM and the British firm became ICT and later ICL. 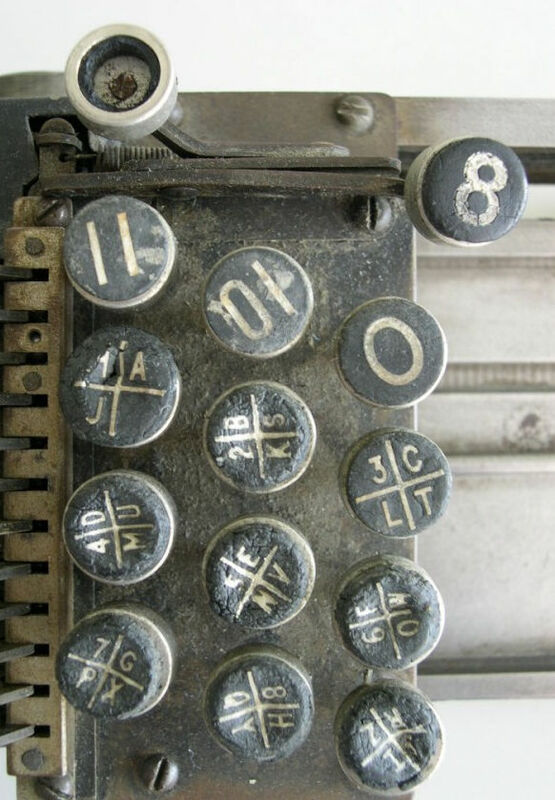 In 1919 BTM began manufacturing their own keypunch machines using an 80 column format with rectangular holes. The original Hollerith code was based around a 45 column card with round holes, which IBM would use until 1928 when they adopted the 80 column BTM format with rectangular holes. The keypad has total of 14 keys. The topmost key is the card release key. The second key from the top [was] a space. The remaining 12 keys were used to punch holes as designated by the key top. Of these 12, the top three keys are the “12”, "11", and "0" or zone punches for alphabetic codes. The manufacturer's tag indicates that this is machine #63312. The author has not posted his pictures but elsewhere on the net http://www.earlycomputers.com/cgi-bin/image-report.cgi?20040505 are some pictures that seem to be very close to what the author has: The picture above looks exactly like the IBM type 001 keypunch which was patented in 1901 and manufactured at least until 1923. In the second picture, note that the BTM nameplate has no patents shown, strongly suggesting that it was either manufactured by IBM or manufactured by BTM under license from IBM (assuming the author's dating is correct.) Also note that its serial number is lower than the author's so it is probably somewhat older. The third photo shows slightly different keytops than the author describes but which are clearly intended to facilitate alphabetic punching. Looking closely at the first picture, it appears that the escapement mechanism does support 80 columns not 45. A little BTM history, from Wikipedia: The British Tabulating Machine Company (BTM) was a firm which manufactured and sold Hollerith unit record equipment and other dataprocessing equipment. The company was formed in 1902 as The Tabulator Limited, after Robert Porter obtained the rights to sell Herman Hollerith's patented machines from the US Tabulating Machine Company (later to become IBM). 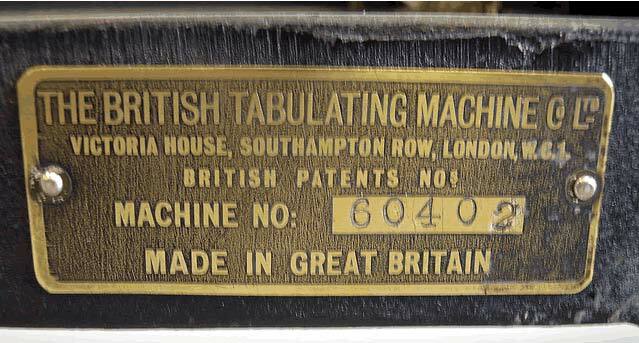 By 1909, the company had been renamed the "British Tabulating Machine Company Limited". In 1920, the company moved from London to Letchworth, Hertfordshire; it was also at this point that it started manufacturing its own machines, rather than simply reselling Hollerith equipment. IBM’s first card had 22 columns and 8 punch positions; then 24 columns and 10 positions (1900); and until the late 1920s, it had 45 columns of round holes and 12 punch positions. But it was not enough, as customers needed to put more data on each card. The challenge, of course, was that the card was running out of room and couldn’t get any bigger. If IBM invented a new or larger card, it would need to replace its entire equipment line and attempt to sell the machines all over again. How could this problem be solved? Lake’s team proposed smaller holes, rectangular in shape, which would be easier to read by the metal tabulators but also require new machines, specifically punches and readers. In the middle of this contest sat James W. Bryce, IBM’s most prolific inventor of the century with more than 500 patents. He knew both colleagues and understood their proposed innovations. Watson asked him to choose the best solution. Bryce voted for Lake’s approach because it could be implemented quickly and required the least adjustment in how tabulating machines worked. Bryce also knew there was little demand for alphabetic information, and wanted to move away from roundholed machines which were more common. Nobody had rectangular holes. 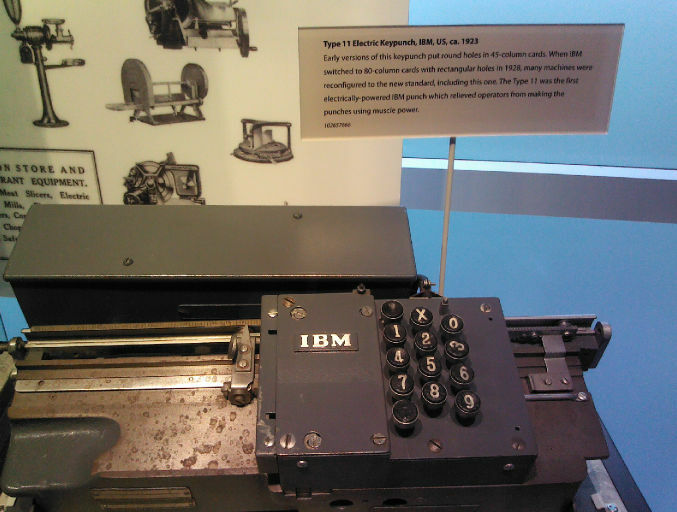 Another fact: IBM's first tabulator with alphabetic capability was not available until 1931-33. So what is the answer to the author's confusion? To help, here is a picture of a type 11 keypunch from our collection. The type 11 was announced in 1923. - 2) reconfigured to 80 column capability after 1933. What we have found supports the author's statement that his machine was built in 1919. - The nameplate on the similar machine shows the company address as London; it probably would have been Letchworth if “built” after 1920. It was probably built by IBM and given a BTM nameplate. No British patents are claimed. BTM did not manufacture its own equipment until after 1920, rather it resold equipment built by Hollerith, later CTR, then IBM. It was later reconfigured to support the 80 column standard. - As the CHM's model 11 suggests, this was common practice. Probably the reconfiguration date was after 1933 when the 401 alphanumeric tabulator became available. The alphabetic keytops would not have had any value until that tabulator became available. It seems very unlikely that BTM would have made an 80 column machine 14 years before there was a tabulator to print 80 column data.